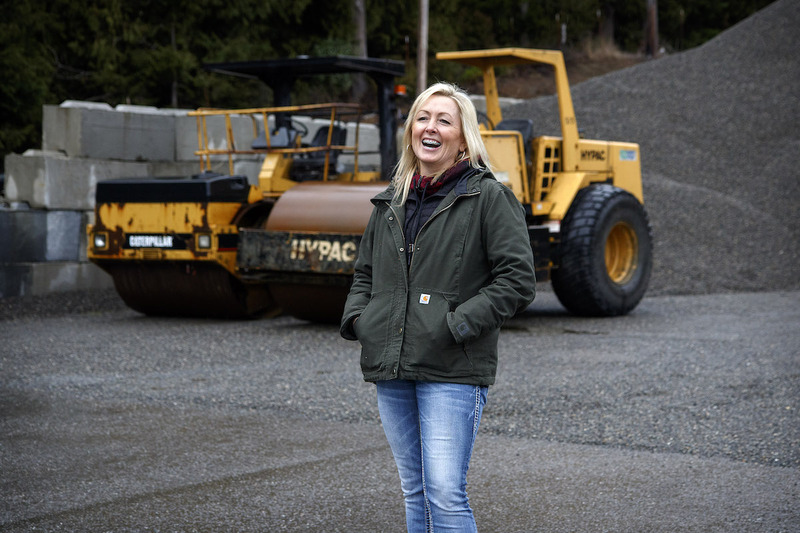 Jackie Gabelein started as a flagger with Public Works when she was 18. Now she is a project manager 25 years later. 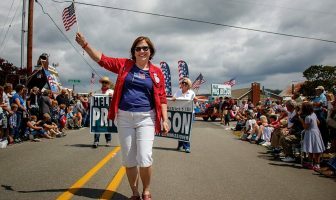 While we shake our heads at news of our federal government’s dysfunction, our county’s Public Works department hums along, thanks in part to some top-drawer women who help run the department, maintain our roads, map our island, and manage our tons of trash. As assistant County Engineer, Connie Bowers manages a staff of 55 in Public Works. Connie Bowers, Island County’s assistant county engineer, found that taking physics in high school helped her see how math could be used to predict and analyze real life problems. While attending Texas A&M to earn a mechanical engineering degree, she was lucky to land a job troubleshooting for the early space shuttles as part of a cooperative work and school program. Since 2011 working as assistant county engineer, Bowers helps oversee a $25 million budget, leads a team of 80 people in the roads division of Public Works, including four road shops, an engineering team, transportation planning, traffic engineering, and planning coordinators. Her engineering, negotiating and management skills culminate in public service that provides a safe driving experience for those traveling the county’s nearly 600 miles of roads. She spends time securing grants and planning for the future which is included in the six-year projection of the Island Transportation Improvement Plan. 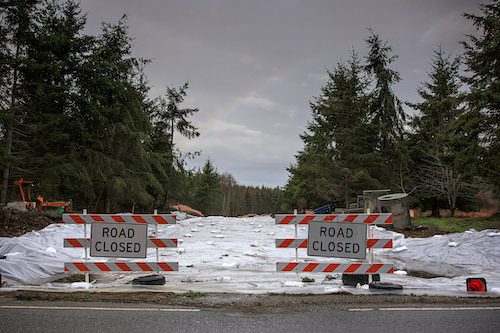 She talked of a new 1.5 mile $6 million arterial road off Houston Road, south of the intersection of Hwy 525 and the Coupeville ferry turnoff that will open this year. The new road will provide an alternate route to what is considered a traffic ‘pinch point’ of traffic congestion on the highway. Bowers’ calm and confident demeanor, is helped, perhaps, by her fatigue-reducing blue fit board, resembling a bent skate/snow board that she stands on while analyzing data on two flat screens. While I talked to the various staff in her department, I noticed a sense of well-being and co-operation throughout that speaks to good management.“I believe in the strength of my staff,” was her answer to a question about management style, one she said is reflected by her boss Public Works Director and County Engineer Bill Oakes. As an Island girl who grew up playing with trucks and a grandpa named Eldon Lambert who worked at the Bayview Road Shop, Jackie Gabelein has earned her way to Project Manager through hard work as a flagger at the age of 18, then digging ditches, knowing how to run every piece of road equipment, getting out in dirty weather to plow and sand the streets, and being a person you just naturally want to get along with. Now working with Public Works 25 years, Gabelein manages pavement preservation projects for Island County. She gets input from a consultant who visits every summer, documenting every crack and road recession, helping Gabelein plan for repaving and whether it needs additional ice abatement. Numbers? “We used 17,000 tons of gravel and 30,000 gallons of oil in paving for 2018,” she said. Now that she works in an office, she’s not driving the bulldozers and excavators she once enjoyed operating. “But I’ve got a key to every piece of equipment,” she said. Kelli Short is the Oak Harbor Road Shop Supervisor and was out of town when this story was written. Colleen Jokinen manages Public Works and keeps the ship smooth sailing. 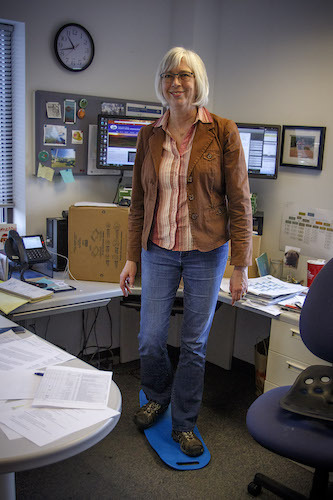 Colleen Jokinen works as a senior finance business manager and said even after 20 years, the work she does is still interesting, which involves accounting, HR and working with the budget. “I’m impressed with our staff,” she said. “The people are dedicated and passionate about their work. 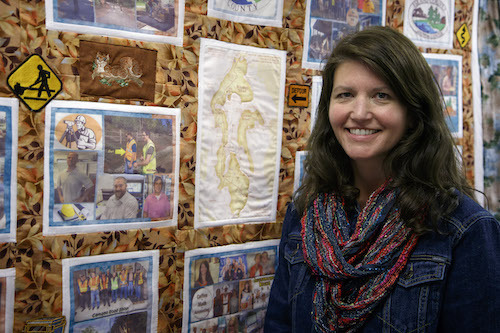 People here are Number One.” A Public Works accounting colleague, Lyn Little, made a quilt collage with embroidered road equipment, fabric photos of Public Works staff and a motto: “Coffee and Math equals accounting,” that hangs on the wall outside Jokinen’s office giving the place a homey community setting. Becca Blackman maintains the county’s GIS database and is a mapping wizard. Becca Blackman, the county’s GIS Coordinator, loves maps. GIS is an acronym for Geographic Information Systems. GIS is a mapping technology that allows the user to create and interact with a variety of maps and data sources and integrates databases with maps tied to specific known locations. 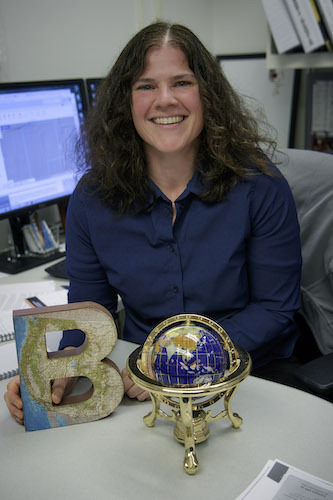 She has two globes in her office and works as a liaison for Island County departments managing the county’s new Enterprise GIS database, doing web mapping, work flow redesigns to create efficiencies, and is involved in creating a database that accurately links addresses of properties to emergency services. “That project is big and exciting,” she said. Her dream is to create a mapping system with links to recorded documents for properties (surveys, plats, and easements) where these files can be found by staff and the public by clicking a property on the map. She hosts an annual GIS day event each November. Her enthusiasm for mapping is contagious. Check out her webpage on mapping. Jonantha Guthrie manages the county’s solid waste disposal and recycling yards. “I thoroughly enjoy working in the Solid Waste Industry; it’s fun to talk trash,” Guthrie said. She was away at meetings the day of the photo shoot. “I am part of a state-wide organization of Solid Waste Managers that regularly meet to exchange ideas and stories to help better our individual county programs. The group is called the Washington Association of County Solid Waste Managers (WACSWM), and I am currently on the executive committee. A friendly woman and veteran who knows the ropes of the trash and recycling business is Gynon (pronounced Ja-non) Nash, who began as a scale-house attendant 21 years ago and in 2010 was promoted to Solid Waste Attendant Supervisor. In her role she trains attendants, makes schedules and ensures operators have good working equipment. 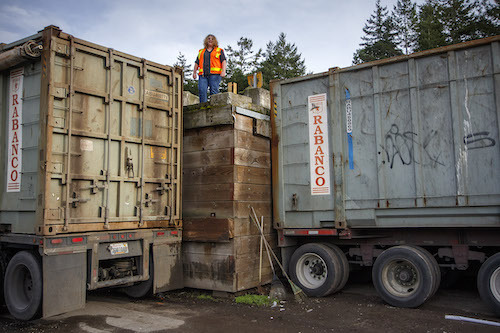 Of the 55,300 tons of trash processed last year, six to eight full semi-truck trailer loads a day are driven to Burlington where they are offloaded to an eastbound train and taken to the Roosevelt Regional Landfill in Roosevelt Washington. To learn more about Maps, Parks and Trails, Solid Waste, Roads and Surface Water click in at this site: Island County Public Works. Kate’s background includes a career in newspaper reporting in Los Angeles for various weeklies and dailies, including The Los Angeles Times. 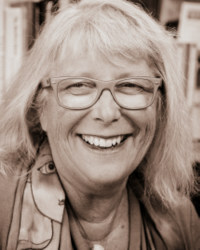 She was a frequent contributor to the online Whidbey Life Magazine. She is working on her third young adult novel with a writing partner. These days, besides working as a personal chef, she writes about the big and little issues that face our island. ‘This is Whidbey’ is her first publication. 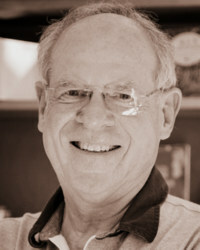 David Welton is a retired physician who was a staff photographer for Whidbey Life Magazine since its early days. His work has also appeared in museums, art galleries, newspapers, regional and national magazines, books, nonprofit publicity, and on the back of the Whidbey Sea-Tac Shuttle!